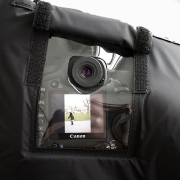 This camera all-weather cover offers a real all-round protection. The noise-reducing lining is perfect for photographing at events were silence is required, e.g. in a theatre. Additionally the lining protects the camera and hands against the cold. This way your camera will be your constant companion in the snow or when you are mountain climbing. The water-resistant outer layer protects the camera from rain, snow and dust. 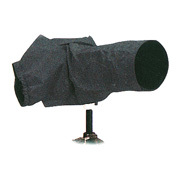 This all-weather cover offers enough room for large professional cameras or cameras with a battery grip. The cover is open at the underside so that it can be pulled over the camera. It can be closed with a hook-and-loop fastener so that the camera noise is still reduced. There is an opening on the right side of the all-weather cover through that the camera can be reached. The lens opening can be closed with a toggle. Above the lens opening in a hidden pocket is an extractable lens cover with which a telephoto lens can be covered. 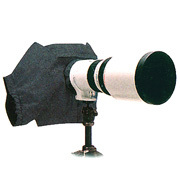 The lens cover is extractable up to a length of 40cm. At the back of the all-weather cover is a viewing window made of transparent plastic that allows you to see the display of your camera. The viewing window has a gap for the viewfinder so that you can look through the viewfinder unobstructedly. The gap can be closed with a hook-and-loop flap.